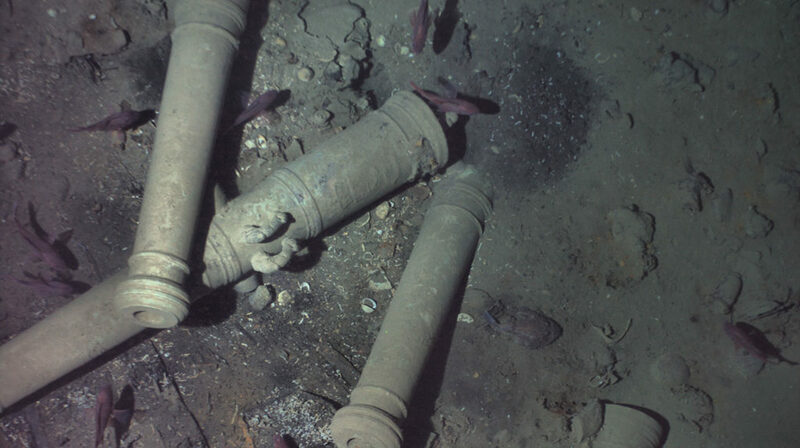 The wreck of the San José, a gold-laden Spanish galleon sunk in 1708, has been identified thanks to its distinctive bronze cannons. To confirm the wreck’s identity, REMUS descended to just 30 feet above the wreck to capture photos of its cannons. Image credits Woods Hole Oceanographic Institution. Around 310 years ago, at the height of the War of Spanish Succession (a conflict that Spain and France were fighting against England), one ship laden with treasure set sail from the Americas towards Europe. Beset by English foes, the ship was sunk with all hands aboard in the Caribbean Sea. Now, the ship’s wreck has been officially identified. The identification was made possible by the ship’s onboard artillery: the guns, cast in bronze, still sported their ornate and distinctive dolphin engravings. The cannons were investigated by REMUS 6000, an autonomous underwater vehicle (AUV) that got within 30 feet (9.1 meters) of the shipwreck in 2015, according to Woods Hole Oceanographic Institution (WHOI). The WHOI had determined the shipwreck’s identity in 2015, but it didn’t have approval from affiliated agencies (Maritime Archaeology Consultants, Switzerland AG, and the Colombian government) to make the findings public until now. The San José was part of what the Spanish called their ‘treasure’ or ‘silver fleets‘: crafts that would traverse the Atlantic Ocean to shuttle immense riches from the Americas towards Europe, where they would fund Spanish war efforts. Individual fleets were made up of several ships, each highly specialized, to make sure this spoliation went along as smoothly, efficiently, and uninterruptedly as possible. The San José was the largest galleon and flagship of one such treasure fleets. Bristling with 62 guns across its multiple decks made the prospect of attacking the Spanish treasure a very unattractive proposition for both pirates and rival nations. But hubris, as it often does, would eventually prove to be the galleon’s undoing. While it was the San José’s job to actually ferry the riches every year, the other ships in the fleet were present to guard it against would-be assailants. However, in 1708, as the escorting ships were delayed in linking up with the galleon, Admiral José Fernandez de Santillan, count of Casa Alegre and the ship’s captain, decided to set sail without them. On June 8, 1708, it was beset upon by four English ships. After a pitched battle, a stray shot ignited the San José’s gunpowder stores — sending the ship, the treasure, and its almost 600-strong crew to the bottom of the sea. It is, to this day, one of the most expensive maritime losses in the world. The cargo, consisting of gold, silver, and emeralds mined in Peru, is estimated to value between $4 billion and $17 billion today. During the bitter war against England, it would have been a monumental loss for Spain. The shipwreck was discovered by an international team aboard the Colombian Navy research ship ARC Malpelo on Nov. 27, 2015, at over 2,000 feet (600 meters) deep, near Colombia’s Barú Peninsula. Because the wreck’s identity couldn’t be confirmed at the time of the discovery, the WHOI sent the REMUS 6000 to the site. “The REMUS 6000 was the ideal tool for the job, since it’s capable of conducting long-duration missions over wide areas,” Mike Purcell, WHOI engineer and expedition leader, said in a statement. Recordings taken by the autonomous vehicle revealed the ship was partially covered in sediment — however, it also captured the decorative carvings on the cannons on a subsequent dive. From them, Roger Dooley, the lead marine archaeologist at MAC, was able to confirm the ship’s identity, the WHOI adds. The Colombian government plans to build a museum and conservation laboratory to preserve and display the shipwreck’s contents, including its cannons and ceramics.